“As a refugee, education gave me hope, and at every turn, generous and kind individuals – like George Soros or that local high school principal – rewarded my talent and hard work with extra attention,” says Masic. It is the strong belief of Admir Masic, Assistant Professor of Civil and Environmental Engineering at MIT, that education changed his life when he most needed it after fleeing war-torn Bosnia and Herzegovina back in 1992 which led him to spearhead the launch of the MIT Refugee Action Hub (ReACT), a center that designs and deploys new learning opportunities for displaced populations around the world. Masic and Vice-Chancellor Ian Waitz championed the launch of the initiative in May 2017 following a collaboration with MIT Solve to tackle the challenge of refugee education. The initiative instantly received the support of fellow MIT graduates Hala Fadel, Thomas Ermacora, and Riccardo Sabatini. “It was simply clear to me that MIT and its generous global community would support ReACT and give talented refugees around the world access to excellent learning and mentoring opportunities” comments Masic. He is certain that innovation and strong partnerships are key to reaching a bigger number of motivated people around the world who deserve a second chance in receiving a quality education; after all, Einstein was once a refugee too. Executive Director Robert Demetrios Fadel has been very proud of the popularity and enthusiasm shown in the program, encouraging further support and improvements. “With the reach of our network and ReACT’s partners, we have again admitted a larger and equally qualified group [of refugees] – over 50% women” Fadel commented. Education has proven to improve the quality of life to refugees around the world, empowering them towards economic independence and social mobility. When the second cohort of ReAct was announced, the program received over 1000 applications from 50 countries. “ReACT can replicate this number and introduce new program models so that more refugees can achieve their educational and professional aspirations” Fadel adds. The impact of the ReACT initiative, to which MIT Enterprise Forum Pan Arab is an inaugural Seed Partner, does not end at the conclusion of the program but extends to offer supplementary academic and vocational opportunities. Students benefit from different internship opportunities such as one at the European Organization for Nuclear Research, which ReACT alumnus Fatima Alrashdan has recently accepted. Last year’s computer and data science cohort is proof of the impact such initiatives cause on the lives of underserved communities. Nearly half of graduate students have already secured a job upon graduation, while 4 students have started working on their own startup ventures, and one student applied to MIT’s computer science PhD program. For example, Hachem Bolbol, a Syrian refugee residing in Lebanon and a ReACT student had recently finished a three-month internship at Kirontech where he learned from the tech-development team. “The internship with Kirontech was a whole new experience for me and I was finally seeing what my knowledge and skills would do in the field”, Bolbol remarks. Hashem is currently developing a device - a Raspberry Pi micro-controller– which detects a series of handwritten digits and then audibly pronounces them. Hashem is awaiting visa clearance to travel to Amman for ReACT’s graduation ceremony this January. The initiative currently runs two different programs. The first pilot, launched exactly a year ago, is the Computer and Data Science Program with its first cohort currently progressing through the online learning portion of the program, mastering MIT edX courses in Computer Science and Data Analytics. The second program is the newly launched track Data, Economics, and Development Police (DEDP) in partnership with the Abdul Latif Jameel Poverty Action Lab (J-PAL). The program provides a select group of refugees free access to online MicroMasters courses, in-person workshops in entrepreneurship, innovation, and professional development, and paid internships in the development field. Both programs offer a blended model specifically designed to meet the needs of refugees and other displaced persons with the goal to enable refugee learners to advance both their education and professional careers in an accessible manner. 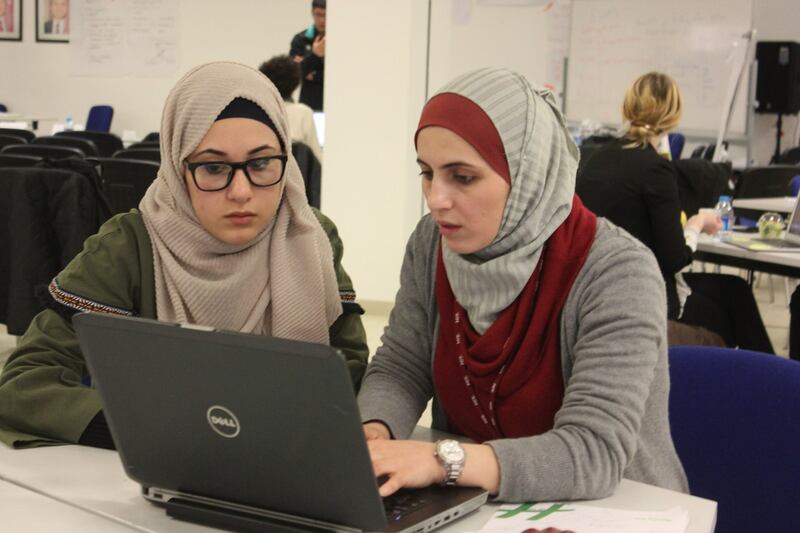 The first cohort of the Computer and Data Science Program will be graduating during the final award ceremony of Innovate for Refugees (Third Edition) which will take place on January 27 at the King Hussein Business Park, Amman. Registration and more information on the event can be found here.